Skyborn Skateland, which was originally owned and operated by Skyborn Skateland Inc., opened its doors in 1956. Chakeres Theaters, which currently owns the property, purchased the Skyborn Theatre in 2009 and operated the drive-in theatre until it closed at the end of the 2015 season. BATH TOWNSHIP — A local paving company is seeking to rezone four parcels in Bath Township that would likely lead to the demolition of two landmarks that were popular entertainment icons for more than six decades. Barrett Paving Materials, Inc. is asking township trustees to approve the rezoning of properties located at 235 and 5309 Haddix Rd. from B-1 Business to Q-M Mineral Extraction, Storage, Processing, and Manufacturing. 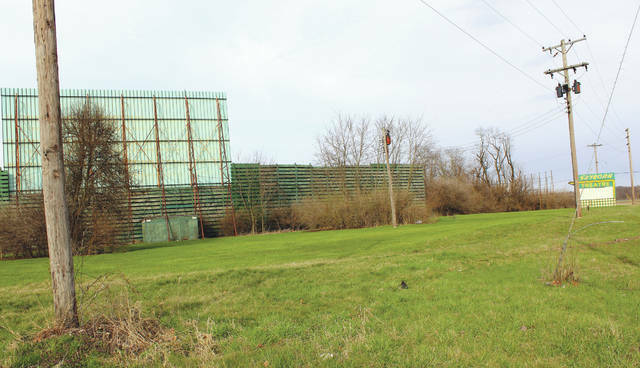 If approved, the rezoning plan would result in the demolition of Skyborn Drive-in Theatre and Skyborn Skateland, according to Bath Township Zoning Inspector Jim Miller. “Barrett did advise that even though both structures would be dismantled, they would be interested in working with the historical society if there is an interest in preserving the old Skyborn Drive-in Theatre marquee,” he added. 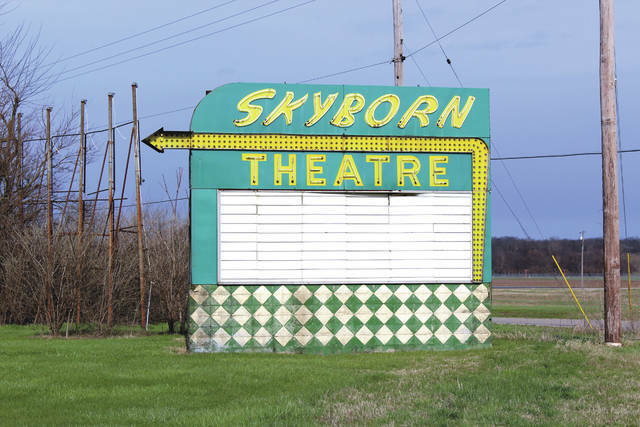 The Skyborn Drive-in Theatre first opened for business on May 17, 1950. Delber Kinsel owned and operated the drive-in theatre until his death in 1957. Subsequently, Kinsel’s widow sold the business in 1958 to Sidney C. Brant & Associates of Cincinnati for $110,000. Chakeres Theaters, which currently owns the property, purchased the business in 2009, and operated the drive-in theatre until it closed at the end of the 2015 season. Skyborn Skateland, which was originally owned and operated by Skyborn Skateland Inc., opened its doors in 1956. On Aug. 14, 2002, Ripp Family Enterprises LLC purchased the 18,662-square-foot roller skating rink and operated the business until 2010. At that time, Erica Collins, along with her husband, took over the operations of the roller skating rink. However, the couple defaulted on the lease-to-purchase agreement in June 2015, and David Ripp regained full oversight of the property in July of that year. The township board of trustees will also consider two other requests to rezone several parcels in the township during the public hearing. Linebaugh Properties Inc. is asking the township trustees to approve the rezoning of two parcels, located at 1256 W. Dayton-Yellow Springs Road to M-2 Restricted Industrial. One parcel is currently zone B-1 Business and the other parcel is zoned A-1 Agriculture. Miller said Eco-Green Recycling Enterprises LLC. has operated at the Dayton-Yellow Springs Road location since 2009. The Class IV, Ohio EPA composting facility produces mulch, compost and enhanced topsoil and accepts yard waste materials, such as tree branches, tree logs, wood chips, leaves and grass. Miller pointed out that the M-2 Restricted Industrial zoned land use would better reflect Eco-Green Recycling Enterprises LLC current business activities and protect the business’ investment. The board of trustees will also take action on a request to rezone a parcel of land located at 9500 Adams Road. The residential property currently has a Huber Heights R-2 zoning designation but is no longer within the Huber Heights city limits. The purpose of the resolution is to rezone the property as an R-1A Suburban Residential District. The township zoning commission recommended approval of all the rezoning requests during the commission’s meeting on April 2. The Bath Township Board of Trustees will take action on the rezoning applications at a public hearing, 7 p.m. Wednesday, April 18 at the township’s administration building, 1006 Yellow Springs-Fairfield Road. The township trustees will meet in regular session immediately following the public hearing. The public can attend both the hearing and township meeting. https://www.fairborndailyherald.com/wp-content/uploads/sites/50/2018/04/web1_Skyborn-Skateland-1.jpgSkyborn Skateland, which was originally owned and operated by Skyborn Skateland Inc., opened its doors in 1956.
https://www.fairborndailyherald.com/wp-content/uploads/sites/50/2018/04/web1_Skyborn-Drive-in-Theatre-screen-and-marquee-1.jpgChakeres Theaters, which currently owns the property, purchased the Skyborn Theatre in 2009 and operated the drive-in theatre until it closed at the end of the 2015 season.